When looking to develop a competitive graduate program why not consult your target market? One company decided to do just that, engaging a team of Bachelor of Commerce students for a 12-week consulting project. Dentsu Aegis Network (DAN) is a global communications network – the third largest in the world. With demand for their services increasing, they saw the need to hire recent graduates even though they did not yet have a formal recruitment program in place. Recognising a need to develop an attractive and effective graduate program, DAN signed on third-year Bachelor of Commerce (BCom) students Kyle Bennetto, Julia Holme, Shenghao Leong, Emma Poole and James Zhao, who formed the Avant Garde Advisory (AGA) group, to tackle DAN's challenge, under the subject Management Consulting. The project aim was to design a competitive graduate program that will attract and develop a highly skilled and cross-functional workforce, one that is adaptable and in synergy with DAN’s business model. After defining the project aims and scope, the AGA team outlined their plan and timelines before conducting primary and secondary research. With a predominantly qualitative approach, they interviewed DAN staff from across all levels, including current graduates. Quantitative data was also collated from internal and external sources. The team analysed the data and produced a comprehensive written report that detailed their findings and outlined a series of recommendations. The students proposed five general initiatives for immediate implementation as well as programs for future consideration by DAN. Using the insight that comes from being members of their own target audience, they were able to tailor the program to attract and retain the best graduate talent. The project culminated in a formal presentation to DAN, an experience Holme describes as “one of the most terrifying and exciting things I have done at Uni”. Having a supportive team and an understanding client helped. “I am very proud of our work over the 12-week semester, and the presentation became a celebration of our work”, Holme said. Management Consulting can also benefit students by helping to shape career direction, as Kyle Bennetto discovered. “I believe the subject helped refine and place emphasis on what I want from a future career. By being placed in an organisation that is fully functioning around you, you begin to pick up on qualities and experiences that you want going forward” Bennetto says. James Zhao agrees that there is much to be gained by taking a subject that is outside of the traditional classroom setting. “Real life experiences are extremely hard to obtain, yet they are crucial for a valuable head start in any career. I have always wanted to know how it feels to work in a real business environment, and being able to put all the theory that I’ve learnt into practice – and it looks good on my resume." We feel very fortunate to have some of the brightest student minds in the country working with our elite talent base. Understanding millennials is a challenge and opportunity for any organisation and this project provided another data point to make Dentsu Aegis Network an amazing place to work. 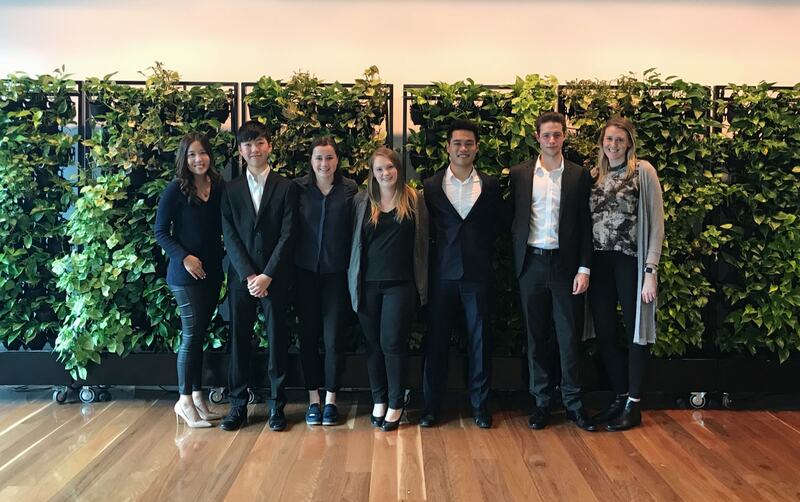 It was a wonderful experience hosting the students from the University of Melbourne – Emma, James, Julia, Kyle and Sheng. We found their energy and positivity to be simply infectious and looked forward to the days when they would be in the office. They were each unique in their thought process and we thoroughly enjoyed mentoring and working with them throughout the project. Needless to say, we were impressed with the calibre of the recommendations put forward in their final presentation and report. Management Consulting is a work-integrated subject in the Bachelor of Commerce that gives students the opportunity to undertake a real client-specified business project of strategic importance.